We are a group of 40 physical, occupational and speech therapists who team together to meet the needs of families who have children with developmental needs. Arcadians live and work throughout Arizona providing in home care for families. We enjoy a blend of freedom and structure. We have freedom to sculpt our own path of learning and set schedules that enable life outside of work! Our innovative structure keeps us organized and well connected with our team members. The Office Gang, nestled in the garden-filled Arizona Center in downtown Phoenix, guides and supports us in fun and significant ways. 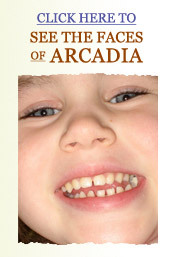 Copyright © 2008, Arcadia Therapy Services. All Rights Reserved.